All about Bonneville Power follows or skip down to re-imagining the future. The Bonneville Power Administration (BPA) was created by the federal government in 1937 to market and transmit the electricity generated by the 31 dams on the Columbia River and it’s tributaries, as well as the Hanford nuclear power plant in Washington. It is also responsible for funding efforts to prevent the extinction of migratory salmon and steelhead that inhabit the Columbia and Snake Rivers. Returns of salmon and steelhead to their spawning grounds in Washington, Idaho, and Oregon declined precipitously as each new dam was constructed. 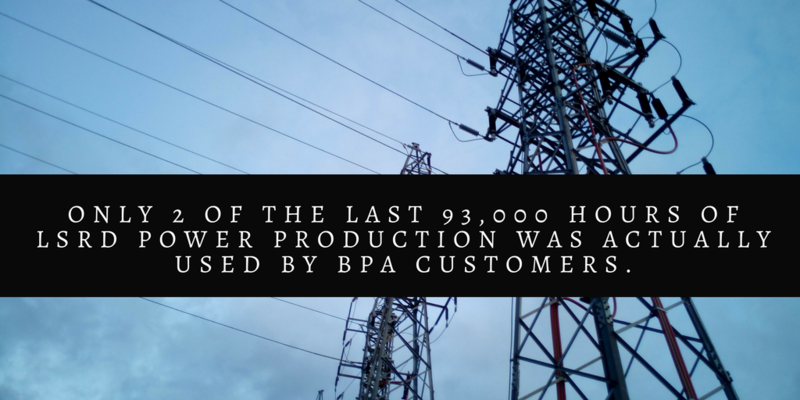 In recent years as the hydrosystem has aged, maintenance costs and fish mitigation costs have risen causing BPA to raise it’s electricity rates. Dam advocates, in an effort to thwart any efforts to possibly remove some of the dams, have grossly overstated the benefits of the 4 dams located on the lower Snake River. The four lower Snake River dams — Lower Granite, Little Goose, Lower Monumental and Ice Harbor — have a collective “nameplate capacity” of 3,033 Megawatts – a meaningless number unless there is sufficient streamflow to operate the projects at their rated output. With few exceptions, hydropower dams rarely operate at nameplate capacity and the four lower Snake River dams are no exception. If operated at nameplate capacity, the four dams would generate just over 26.5 million megawatt/hours per year or 3,033 annual megawatts (aMW). The lower Snake flow and generation records for the last 11 years (2004-2014) show that the actual generation of the four dams was substantially lower than nameplate capacity – on average 961 aMW. In other words, over the last 11 years, the four dams’ generation averaged less than 32 percent of nameplate capacity. The reliability of hydropower generation is governed by the availability of stream flows that drive generators. During the winter, snow accumulates at higher elevations while lower elevation rain events boost stream flows above their low summer and fall flows. In the early spring, melting snow combines with warmer rains to start the runoff season during which a large percentage of annual stream flows occur. Due to lack of reservoir storage, the four lower Snake River dams are only able to generate power in a “run of river” fashion that mirrors seasonal runoff cycles. The bulk of lower Snake River generation occurs from February through June. Nearly a third of the annual generation occurs during the months of May and June when supply is high and demand is low. When the power is most needed, the lower Snake River dams are unable to meet the energy demands of the coldest and hottest months of the year. BPA cites the ability to “over generate” during emergency periods. According to the data, over generation that equaled or exceeded a 24 hour period occurred at two dams for two days each, in 11 years; and even then the over generation was only a fraction above the nameplate capacity of that individual dam. In addressing the value of hydropower generated by the four lower Snake River dams, there are two factors to consider – the actual value of the power produced and the cost of replacement power to be used when the dams are breached. Hydropower from the four dams is primarily sold under contract at a Tier-1 fixed price that is currently $31.50 per megawatt/hour. Therefore, the average value of the four dams’ hydropower over the last 11 years is just over $265 million annually when computed with the current Tier-1 price. The Army Corps of Engineers’ 2002 breaching analysis estimated replacement power costs to be $271 million annually – primarily generated by natural gas combined-cycle combustion turbine plants. In its discussion of replacement power costs, the Corps incorrectly dismissed energy conservation and development of renewable energy. Today, wind generation in the northwest has a nameplate capacity of 8,975 Megawatts and generated 2,007 aMW of power in 2012. Wind energy has more than doubled the average generation of the lower Snake River dams. Moreover, the Idaho Public Utilities Commission recently approved 13 solar power projects for southern Idaho with capacity of approximately 400 Megawatts. Wind, solar, biomass, conservation and efficiency upgrades have already replaced hydropower from the lower Snake River dams several times over with affordable and renewable energy—a trend that promises to continue. Puget Sound Energy has constructed 3 wind farms in central and southeast Washington, two of which are near the lower Snake River. Find out more how these wind farms are supporting local economies while generating clean, renewable energy. Renewable energy sources have replaced the output of the Lower Snake dams several times over and the dams do not provide peaking power due to low flows and fish passage limitations. Wind energy has exploded in Washington and Oregon, tapping private investment and now producing more electricity by far than the four lower Snake River dams.